This week my husband and I were invited to a friend's house for a Beaujolais Nouveau Party- and although we were specifically instructed to not bring a bottle of Beaujolais (it is a terrible wine but a great reason to have a party! )- we were asked to bring along a dish- preferably something homemade and / or something from our own heritage. For me… the decision was easy. It is my family's tradition to make several different kinds of holiday cookies…. but which ones to make for this party? After some consideration, I decided upon my great-grandmother's snickerdoodles and a new variation on my kids favorite cookie- the meringue. 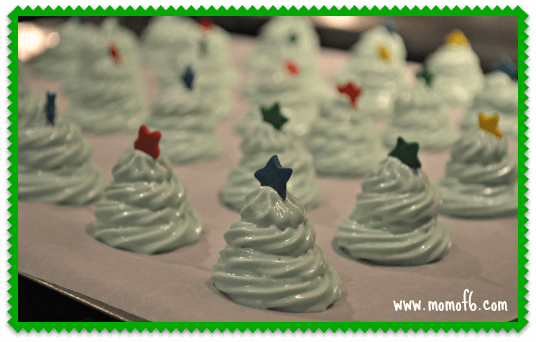 So I baked up a big batch of these Christmas Tree Meringues! 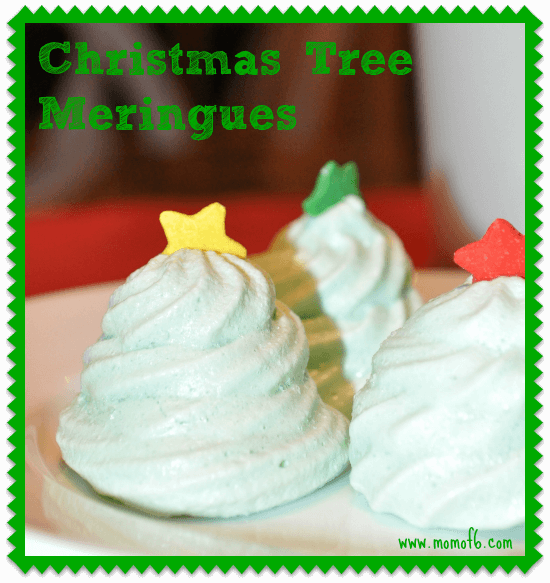 I decided to stick with my own tried-and-true meringue recipe which I traditionally use to create Santa hat meringues. 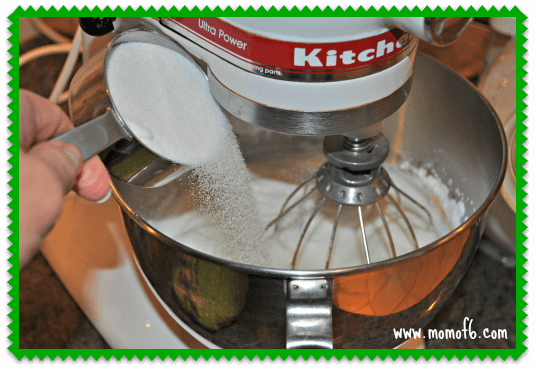 Using an electric mixer with whisk attachment, beat the egg whites until soft peaks start to form. 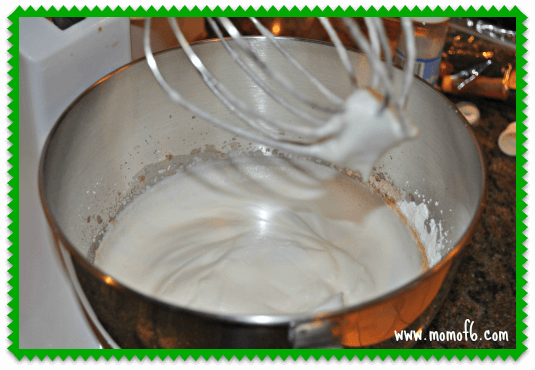 While beating, add the cream of tartar and vanilla extract, then slowly add the 1/2 cup of sugar. Continue to beat until the peaks stiffen. Since I wanted my Christmas trees to be green, I added some blue and yellow food coloring and then mixed some more. 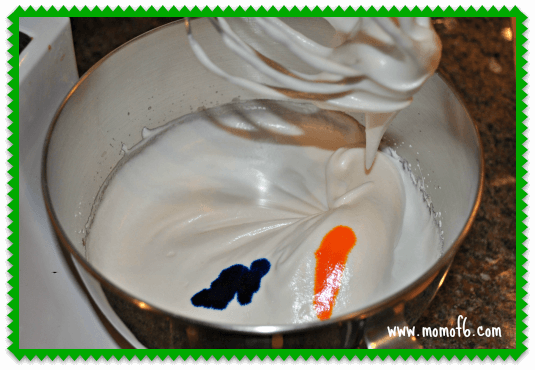 The meringue should be glossy and stiff. When I lifted my beater from the bowl, the meringue “trail” remained in place- connecting the beater to the meringue in the bowl. Spoon the meringue into a decorating bag or a quart-sized ziplock bag fitted with a large star tip. 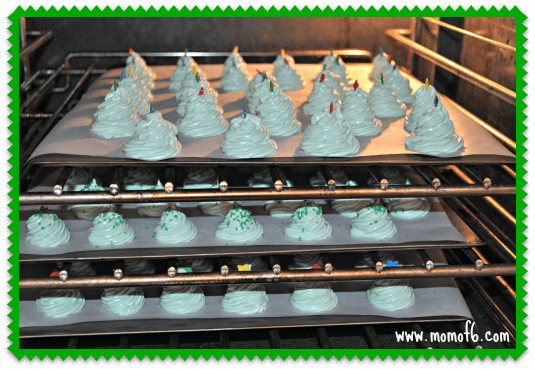 Pipe the Christmas tree shape onto parchment paper on top of your cookie sheet by creating a small circle and then spiraling the meringue into a cone-shape. You can pipe them close-together, as they will not spread when baking. I added small candy stars on top of each tree. Bake the meringues for one hour and twenty minutes, and then turn off the oven and allow them to remain in the cooling oven for an hour to crisp. 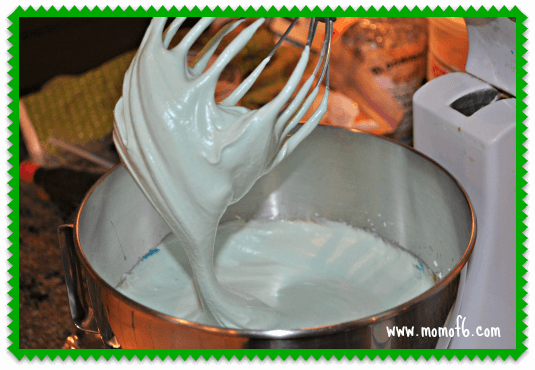 These cookies are my kids favorite holiday cookie because they simply melt in your mouth- kind of like cotton candy! 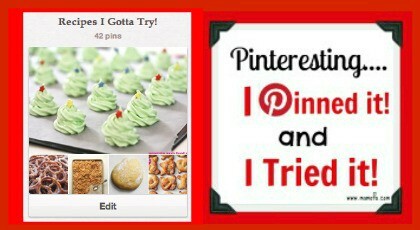 And to stay up to date on the latest pins and inspiration from Momof6, please follow sharonmomof6 on Pinterest! I would love to try these! Can you give us a size to work with? Size of a quarter . Fifty cent piece on the bottom? How tall? About? How long do they keep? Thanks ! Really cute, one of those wanna-try projects! Thank you for sharing. These are so cute! Thanks for sharing:) Found you through the Better Mom link up.